The reversible 3ft USB C to C-Type cable supports USB 3.0 data transfers at 5Gbps and can connect your USB 3.0 Type-C mobile device to laptops or other USB-C enabled device for SuperSpeed data transfer. Supports SuperSpeed up to 5Gbps data transfer. Designed with the Type-C Male reversible connector on cable ends. The USB-C type connection has been tested with the durability of 10,000 connect/disconnect cycles. 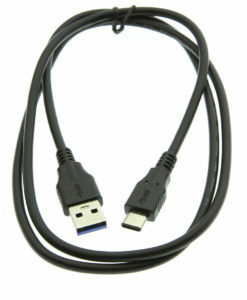 USB 2.0 compatible with Low Speed, Full Speed, and High Speed USB specifications. The USB3-CC1MB “USB-C” or “USB Type-C” cables are the newest version of the universal USB connector that is capable of USB 3.0 throughput (5Gbps Data Transfer) and in the future, the ability to carry more information for applications. 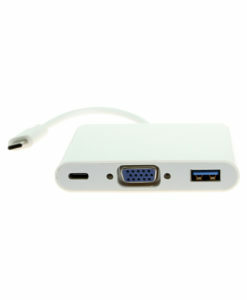 The USB-C connector will work with previous USB version speeds; however, this is based on the USB specifications and proper connection ports must be used. The USB3-CC1MB Type-C Male to Type-C Male cable provides for the use of USB 3.0 Specifications. 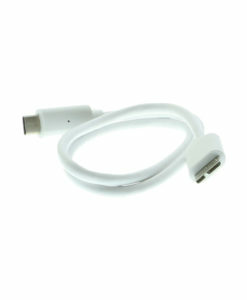 Like the Apple reversible lightning connector, the new USB-C connector is reversible, the user does not have to worry about which way the connector is placed and avoids possible port or plug damage. The USB C-Type connector will not connect into other USB ports as the C-Type connector is uniquely designed compared to standard USB ports. Connects Type-C Male to Type-C Male USB devices. Reversible plug orientation: Power and Ground will be correct regardless of orientation. Usage: Can be used with mobile devices, laptops, and tables supporting Type-C port connections and power output. USB 2.0: Compatible with Low Speed, Full Speed, and High Speed USB specifications. Technical Note: The new C-Type connector (also called USB-C) is a new generation of USB connector that is engineered to support USB 3.0 and 3.1 specification applications. The USB3-CC1MB is a USB 3.0 cable and will only support SuperSpeed applications for data transfers of up to 5Gbps.